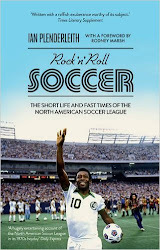 The Sunday Mirror did me the immense favour of reviewing Rock n Roll Soccer this past weekend. It was an astonishing achievement. Not to sound ungrateful or anything, but in the space of just 47 words, the review not only failed to even remotely convey what the book is about, but also managed to make three gross factual errors (or five, if you take into account that one of the errors is tripartite). It also made a grammatical error and a terminology error. That’s an impressive rate of around one mistake every seven words. Error one: it’s not a trip through “the early years” of the NASL. In fact “the early years” only make up about one tenth of the book. It’s an account of all 17 years of the NASL. Error two (discounting the following grammatical error - you can only be “a harbinger of” something, not “a harbinger for”; and Major League Soccer is known as “MLS”, not “the MLS”): MLS is not “lucrative”, it is a league that prides itself on its attempts to be financially stable, having learned from the mistakes of the NASL. It has been lucrative for David Beckham, and it may well one day become lucrative for its current owners, but that’s all a long way off – many of its teams have only just started making modest profits, many others still run at a loss. Error three (and errors four and five): Pele, George Best and Bobby Moore played “cameos” in the NASL? You mean, they showed up, played one game and then left again? Or does the writer (and his sub-editor, and his editor) not actually have a flying clue what a cameo is? Best played for seven seasons in the NASL, Pele for three (bringing it instant world coverage and prompting hundreds more players to follow), and Bobby Moore for two. Apart from that, the review’s spot on. Indeed, I am absolutely convinced that the reviewer read the book from cover to cover. Thank you, Sunday Mirror – your review is a journalistic triumph. I have no doubt at all that the rest of the paper is as scrupulously accurate as this towering two-sentence book review.